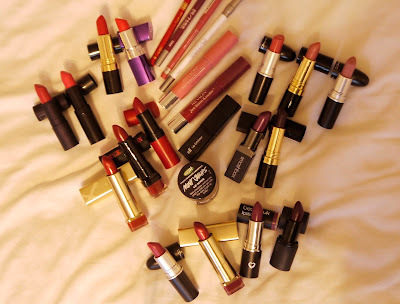 Well most of these are lipsticks, I’ve included a few extra products that are always useful in the colder weather! I tried to narrow this down and I ended up with 16 lipsticks. That’s not at all bad for me! (I may be slightly indecisive when it comes to makeup). Let us start with the neutrals! They’re the top right of the picture. I’ve included mac’s Fanfare & Feed the Sense and Revlon’s Blushed. These are lovely lipsticks that are really easy to wear during the day and quite creamy to apply and so lovely on my lips. I normally wear these on days that I’m either not doing much all over, or if I’m going for a really dramatic eye look and I don’t want to detract from my eyes. Well you can see for yourself in the swatches below. Now for the more reddy toned berry lipsticks! The are on the left of the top picture, the bottom middle group (clear at mud there…). These lipsticks are lovely dark statement red lips. From Bourjois we have Pretty Prune 14 from the rouge edition collection, Rimmel 107 from the Kate line which has a matte finish and from MaxFactor’s Colour Elixir line Chilli. Again these lipsticks are lovely and moisturising. I tend to pair these with a simple eye or a bronze maybe gold eye look. For for a pair of darker pink lipsticks. This pair is on the furthest left. I have included Lipstick Queen Rose Sinner, which is a lovely creamy matte lipstick. It actually pulls quite nice dark raspberry colour on my lips. Next to it we have Rimmel Kate 05, this has a sheen finish and again, it’s quite a dark raspberry pink on my lips. Now on to the reds! I have a warm toned and a cool toned red. Rimmel Moisture Renew Lipstick in Rose Passion which is a lovely warm toned red that is lovely to wear. Revlon Cheery Blossom is a stunning cool toned red. Definitely both statement lips and both lovely to wear. They’re the two lipsticks at the top left of the picture. Now on to the plummy purple tones. I’m a big fan of getting the plummy toned lipsticks out in Autumn and I’ve included a few that you can wear during the day or night. First up is Beauty UK’s Plumalicious, this is without doubt a purple plum toned lipstick, it’s a real statement lip, beautiful colour. Two more wearable plum tones, MaxFactor’s Colour Elixir in Mulberry and mac’s Plumful. These definitely have a plum, berry undertone to them but without being too OTT. Finally is Sleek’s Smother. This is similar to Plumalicious from Beauty UK, however Smother has much more of a pink undertone rather than purple. It’s another statement lip. These are at the bottom of the picture. Now for the final two lipsticks. Now if you’re looking for a darker statement lipstick, these are without doubt, serious statement lipsticks. First up Smashbox’s Vivid Violet. This is a straight up purple violet shade. It’s beautiful and is definitely a serious Autumn shade. Love it! The second is Revlon’s Va Va Violet. This is a much darker shade, it might be more suitable to a night out if you worry about wearing this kind of lip during the day. I would pair these lipsticks with a really simple eyelook – maybe just some eyeliner and mascara. Let you lips do the talking! Now for the extras. I have two Revlon Kissable Bam stains, one in Crush, the second in Honey. Crush is that berry tone that is in keeping with Autumn and Honey is the more neutral shade. I like the balm stains as I find them moisturising and I like the minty scent. A mirror isn’t always necessary for re-applying but might be useful for Crush. Next a few lipliners. First up, Urban Decay’s Ozone which is a clear lipliner and very useful for outlining your lip, another is Venom from Urban Decay. Venom works well with all of the darker or plummy toned lipsticks mentioned. From Rimmel is Eastend Snob, great for the neutrals. Finally from BarryM 3 – no name on it. I think lipliners are pretty much essential when wearing any kind of bold lip, even more so in autumn as the weather cools and our lips have to tolerate more, there’s a higher chance of feathering for me anyway! The last two things to mention are lip scrubs. As I mentioned, our lips take more of a battering from the cold and often wet weather. They need extra love. I keep Lush’s Mint Julips sugar scrub next to be bed and use it twice a week. I also have a lip exfoliator from elf, this lives on my vanity and if my lips look like they need a wee scrub I use it before starting my makeup application. So that is everything, thank you for reading! Any question let me know. You can check out the video below, I tend to chat more about each lipstick in it.